The ISOMETER® is an insulation monitoring device for IT systems in accordance with IEC 61557-8 and IEC 61557-9. It is universally applicable in AC, 3(N)AC, AC/DC and DC systems. AC systems may include extensive DC-supplied loads (such as rectifiers, inverters, variablespeed drives). In combination with the insulation fault locators of the EDS44x series or the appropriate measuring current transformers, an insulation fault location system can be set up with the iso685-…-P.
iso685-D-P: This device variant ISOMETER® iso685-D-P features a high-resolution graphic LC display and operating controls for direct operation of the device functions. It cannot be combined with an FP200. 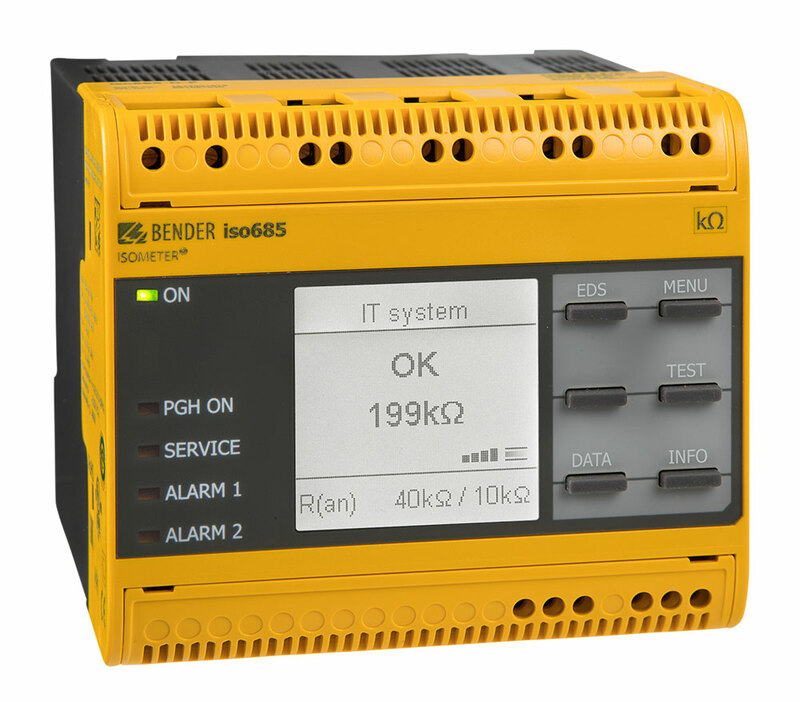 iso685-S-P: This device variant ISOMETER® iso685-S-P features neither a display nor operating controls. It can only be used in combination with the FP200 and it is operated via this front panel. Option "W": The ISOMETER®s with and without integrated display are available with option „W“ for extreme climatic and mechanical conditions (ISOMETER® iso685W-D-P and iso685W-S-P).